Australia's Northern Territory occupies the north central part of the country with a tropical coastline facing the Timor Sea to the northwest, the Arafura Sea to the north, and the Gulf of Carpentaria to the east. Except for the port and naval base of Darwin the coast is thinly populated and difficult to reach. The territory has five more or less traditional lighthouses, all associated with the approaches to Darwin. Unfortunately, all the lighthouses are either closed to the public or difficult to reach, so they are not very well known. 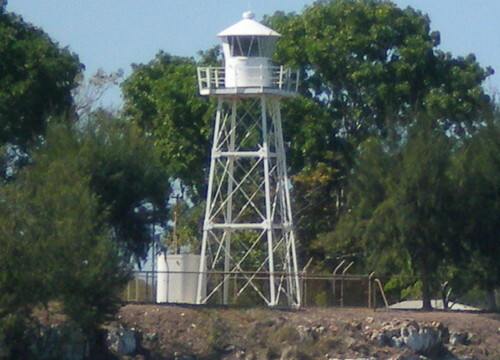 The lighthouses are managed by the Australian Maritime Safety Authority (AMSA) or by the Darwin Port Corporation. ARLHS numbers are from the ARLHS World List of Lights. Admiralty numbers are from volume Q of the Admiralty List of Lights & Fog Signals. U.S. NGA numbers are from Publication 111. The section of the Lighthouses of Australia site devoted to Northern Territory lights. Index to Wikipedia articles; many include photos. Navigation chart for northern Australia. Date unknown. Active; focal plane 30 m (98 ft); three white flashes, separated by 2 s, every 15 s. 15 m (49 st) square skeletal tower with lantern and gallery; entire structure painted white. Lighthouses of Australia has Winsome Bonham's aerial photo and Google has a satellite view. Located at the southwestern point of Bathurst Island, marking the entrance to Beagle Gulf and the beginning of the approach to Darwin from the Timor Sea. The island is an aboriginal reserve and visitors need a permit from the Tiwi Islands Land Council. Tours are available from Darwin. Site open, tower closed. Operator/site manager: AMSA. ARLHS AUS-244; Admiralty Q3318; NGA 9520. Date unknown. Active; focal plane 10 m (33 ft); white or red light depending on direction, 2 s on, 8 s off. 10 m (33 ft) robust concrete post supporting a round platform. No photo available but Bing has a satellite view. Located on the south side of the entrance to Beagle Gulf about 40 km (25 mi) west of Darwin. Accessible only by boat. Site open, tower closed. Admiralty Q3330; NGA 9535.9. 1893. Active; focal plane 39 m (128 ft); white flash every 5 s. 32 m (105 ft) hexagonal pyramidal cast iron skeletal tower with central cylinder, lantern, and gallery, painted with red and white horizontal bands. Wikipedia has a fine article including the photo seen above, Wikimedia has additional photos, Shane Bartie has a 2015 photo, Allan Laurence has an aerial photo, Huelse has posted a historic postcard image of the light station, and Google has a satellite view. The oldest lighthouse in Northern Territory, Point Charles Light was prefabricated in England by Chance Brothers. In the late 1990s, the surrounding land, formerly a Radio Australia facility, was leased to Christian Voice Broadcasting. CVB fenced the property in 2003, shutting off public access to the lighthouse. However, the lease expired in June 2010, and it is reported that access has been restored. Located on a headland about 25 km (15 mi) northwest of Port Darwin. Site believed to be open (more definite information needed), tower closed. Operator/site manager: AMSA. ARLHS AUS-056; Admiralty Q3322; NGA 9524. 1915 (station established 1900). Active; focal plane 18 m (60 ft); three flashes every 15 s, white or red depending on direction. 9.5 m (31 ft) square steel skeletal tower with lantern and gallery; entire structure painted white. A photo is at right, Lighthouses of Australia has a photo, and Google has a satellite view. Wikimedia has historic photos including a photo of the first lighthouse. An LED lamp was installed in 2014. Located in the Larrakeyah Barracks, a historic military post at the entrance to the inner harbor of Darwin. Site and tower closed (Larrakeyah Barracks is now the headquarters of Australia's Northern Command). Operator: Darwin Port Corporation (?). Site manager: Larrakeyah Barracks. ARLHS AUS-071; Admiralty Q3324; NGA 9528. Date unknown. Active; focal plane 9 m (30 ft); two flashes every 10 s, white or red depending on direction. 9 m (30 ft) white fiberglass tower mounted on a square platform supported by piles. No photo available but Bing has a satellite view. Located off the west end of Vernon Island. Accessible only by boat. Site open, tower closed. Admiralty Q3317.5; NGA 9538. Date unknown. Active; focal plane 8 m (26 ft); four white flashes every 20 s. 6 m (20 ft) white fiberglass tower. Anna Strumillo has a view from the sea (misidentified as Northwest Vernon Island) and Bing has a satellite view. Located on the northern tip of Southwest Vernon Island, about 10 km (6 mi) west southwest of the East Vernon Light. Accessible only by boat. Site open, tower closed. Admiralty Q3317; NGA 9536. Date unknown (station established 1928). Active; focal plane 12 m (39 ft); flash every 5 s, white, red or green depending on direction. 11 m (36 ft) square cylindrical white fiberglass tower mounted on a square platform supported by robust piles. James Smith contributed the photo at right and Bing has a satellite view. The present tower is probably built on the same piles that supported the original. The original lighthouse was a square skeletal tower with lantern and gallery that appears to be twice the listed height of the present tower. The light guides vessels approaching Darwin from the northeast. Located just offshore on the south side of East Vernon Island, about 60 km (40 mi) northeast of Darwin. Accessible only by boat. Site open, tower closed. ARLHS AUS-066; Admiralty K3316; NGA 9540. 1928. Active; focal plane 17 m (56 ft); three flashes, separated by 2 s, white or red depending on direction, every 15 s. 16.5 m (54 ft) square skeletal tower with lantern and gallery; entire structure painted white. Lightphotos.net has a closeup photo and Bing has a satellite view. Civil Plus Constructions has photos of a repainting of the lighthouse in 2010. Located at the end of a long peninsula about 80 km (50 mi) northeast of Darwin, marking the entrance to the Clarence Strait, the eastern approach to Darwin. Accessible by boat or helicopter. Site status unknown, tower closed. Operator/site manager: AMSA. ARLHS AUS-245; Admiralty Q3315; NGA 9544. Note: Arnhem Land is a large, very thinly populated region at the northeastern corner of the Northern Territory. 1917. Active; focal plane 50 m (163 ft); white flash every 10 s. 36 m (118 ft) cylindrical concrete tower with lantern and gallery rising from an octagonal base. Tower unpainted, lantern painted white. The keeper's houses have been converted to a fishing lodge; renovated in 2010, they are available for overnight accommodations. A photo is at right and Google has a satellite view of the station. 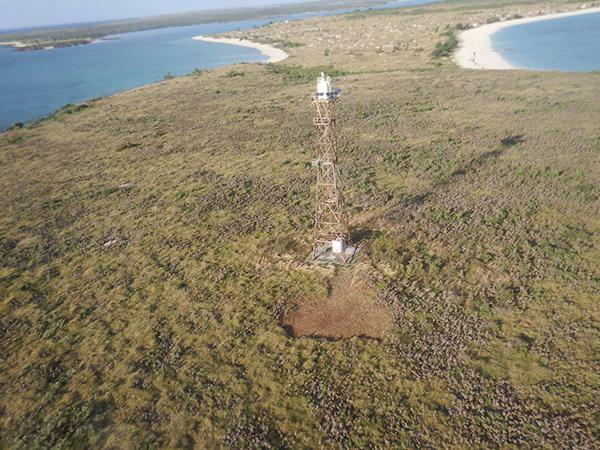 Cape Don is Australia's northernmost traditional lighthouse, standing in latitude 11°18.0' S. This is the only Northern Territory lighthouse on the territory's Heritage Register. In 2005 the original Chance Brothers 3rd order Fresnel lens and its rotating apparatus were discovered in storage and donated to the Queensland Maritime Museum in Brisbane. Located on the western tip of the Cobourg Peninsula, marking the entrance to the Dundas Strait and Van Diemen Gulf. Accessible by boat or by air; driving from Darwin is possible in the dry season but requires permits and careful preparation. Site open, tower closed. Operator: AMSA. Site manager: Garig Gunak Barlu National Park. ARLHS AUS-028; Admiralty Q3314; NGA 9548. Date unknown. Active; focal plane 32 m (105 ft); white flash every 5 s. 4 m (13 ft) white fiberglass tower. No photo available but Bing has a satellite view. Located near the northern tip of Croker Island about 40 km (25 mi) northeast of Cape Don. Accessible only by boat or helicopter. Site status unknown. Admiralty Q3313.4; NGA 9552.2. Date unknown. Active; focal plane 32 m (105 ft); three white flashes every 30 s. 30 m (98 ft) white skeletal tower. A view from the sea (halfway down the page) is available and Google has a distant satellite view. 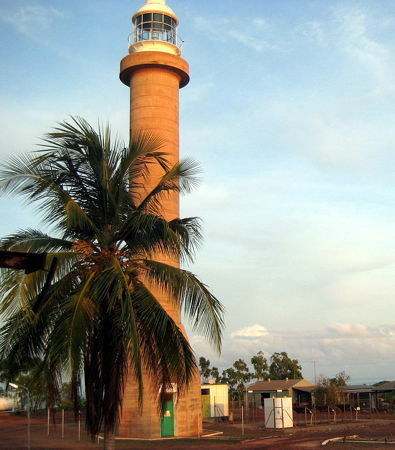 The Northern Territory Library has a 1986 photo of the first lighthouse, a slender round cylindrical steel tower with gallery supported by guy wires. Located on a small island in the Arafura Sea about 60 km (40 mi) northeast of Cape Don. Accessible only by boat. Site and tower closed. ARLHS AUS-179; Admiralty Q3313; NGA 9552. Date unknown. Active; focal plane 12 m (39 ft); four white flashes every 16 s. 7 m (23 ft) white fiberglass tower. No photo available but Google has a satellite view. Haul Round Island is the dry land on a reef off the entrance to the indigenous community of Maningrida. The island is known as the location of one of the largest seabird breeding colonies of the Northern Territory. Accessible only by boat. Site and tower closed. Admiralty Q3312.8; NGA 9552.5. Date unknown. Active; focal plane 14 m (46 ft); two white flashes every 10 s. 6 m (20 ft) square cylindrical skeletal tower, the upper portion enclosed by a white daymark. A photo (next to last photo on the page) is available and Bing has a satellite view. Stevens Island is at the northeastern end of the western and shorter chain of the Wessel Islands, a chain of islands extending 120 km (75 mi) northeast from the Napier Peninsula into the Arafura Sea Located on the northeastern tip of the island. Accessible only by boat. Site open, tower closed. Admiralty Q3312.5; NGA 9553. 1966. Active; focal plane 54 m (177 ft); white flash every 5 s. 30 m (98 ft ) square stainless steel skeletal tower with a white fiberglass lantern. AMSA's aerial photo is at right, the Northern Territory Library has a 1986 photo, and Bing has a satellite view. Lorraine Phelan has a 1972 photo showing an earlier tower. Cape Wessel is at the far northeastern end of the Wessel Islands. The light here guides vessels entering the Gulf of Carpentaria, the large embayment of northeastern Australia. Located on Rimbija Island, the northeasternmost island of the archipelago. Accessible only by boat. Site status unknown. Admiralty Q3312; NGA 9556. Date unknown. Active; focal plane 39 m (128 ft); two white flashes every 15 s. 18 m (59 ft) skeletal tower. No current photo available but Bing has a satellite view. The Northern Territory Library has a photo, taken either in 1975 or 1986, that shows a round cylindrical stainless steel tower like the 1970 Imperieuse Reef Light off the Kimberley coast (in North Western Australia) and the 1974 Pelsaert Island Light in the Houtman Abrolhos Islands (in South Western Australia).The light guides vessels approaching the mainland town of Nhulunbuy. Located atop a small island about 75 km (45 mi) south of Cape Wessel. Accessible only by boat. Site status unknown. Admiralty Q3311; NGA 9560. Date unknown. Active; focal plane 62 m (205 ft); white flash every 5 s. 2 m (7 ft) white fiberglass cabinet. No photo available but Bing has a satellite view. 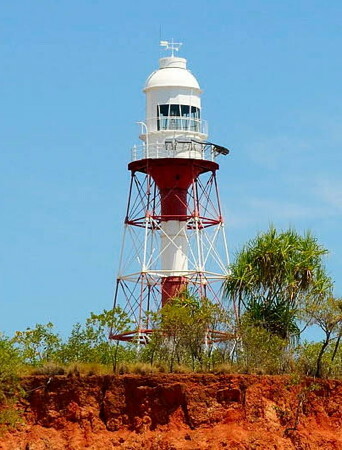 Despite its small size this is an importnat light guiding vessels along the west coast of the Gulf of Carpentaria and approaching Groote Eylandt, the largest island of the Gulf. 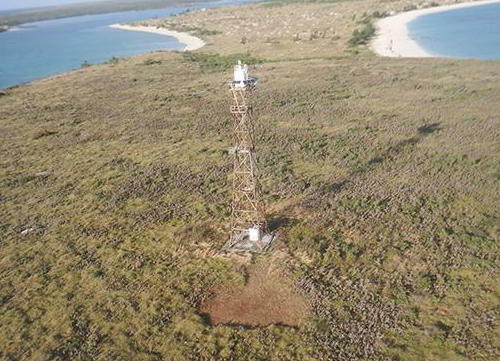 Located atop a small island about 16 km (10 mi) northeast of Groote Eylandt. Accessible only by boat. Site status unknown. Admiralty Q3305; NGA 9568. Date unknown. Active; focal plane 13 m (43 ft); white flash every 2.5 s. 11 m (36 ft) round cylindrical white fiberglass tower. No photo available but Bing has a satellite view. This light guides vessels approaching the mining settlement of Alyangula on Groote Eylandt. Connexion Island is a small island in the channel on the west side of Groote Eylandt. Located on the west coast of Connexion Island. Accessible only by boat. Site status unknown. Admiralty Q3307; NGA 9576. Posted June 25, 2004; checked and revised February 16, 2019. Lighthouses: 14. Site copyright 2017 Russ Rowlett and the University of North Carolina at Chapel Hill.